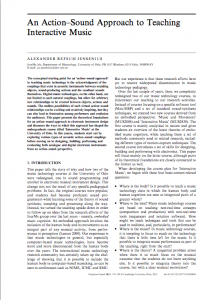 My paper titled An action–sound approach to teaching interactive music has recently been published by Organised Sound. The paper is based on some of the theoretical ideas on action-sound couplings developed in my PhD, combined with how I designed the course Interactive Music based on such an approach to music technology. The conceptual starting point for an `action-sound approach’ to teaching music technology is the acknowledgment of the couplings that exist in acoustic instruments between sounding objects, sound-producing actions and the resultant sounds themselves. Digital music technologies, on the other hand, are not limited to such natural couplings, but allow for arbitrary new relationships to be created between objects, actions and sounds. The endless possibilities of such virtual action-sound relationships can be exciting and creatively inspiring, but they can also lead to frustration among performers and confusion for audiences. This paper presents the theoretical foundations for an action-sound approach to electronic instrument design and discusses the ways in which this approach has shaped the undergraduate course titled `Interactive Music’ at the University of Oslo. In this course, students start out by exploring various types of acoustic action-sound couplings before moving on to designing, building, performing and evaluating both analogue and digital electronic instruments from an action-sound perspective. 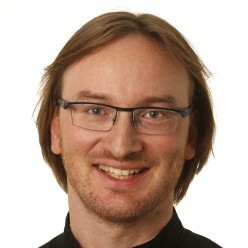 Jensenius, A. R. (2013). An action–sound approach to teaching interactive music. 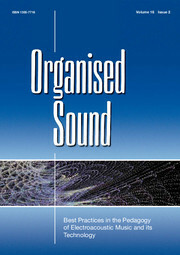 Organised Sound, 18(2):178–189.